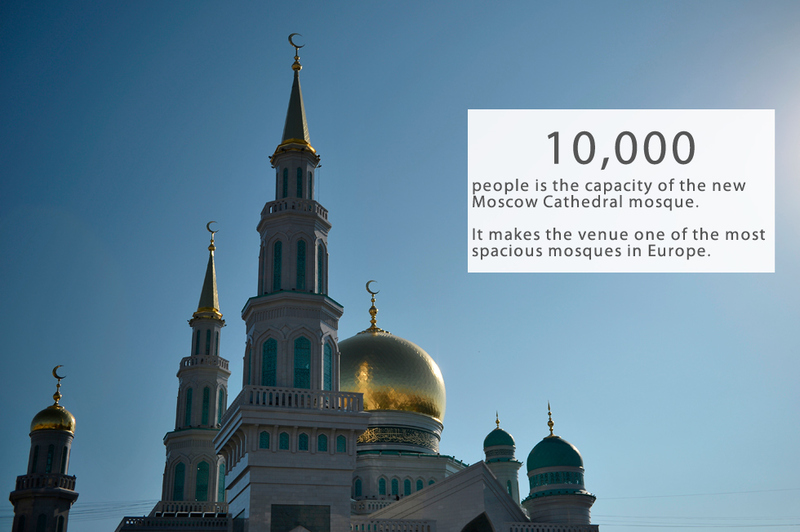 10,000 people is the capacity of the new Moscow Cathedral mosque, which opened its doors to the capital's Muslim faithful on Sept. 23, reports Interfax. It makes the venue one of the most spacious mosques in Europe, the equal of London's Baitul Futuh Mosque. Russia's largest mosque is the Grand Mosque of Makhachkala in the Caucasus republic of Dagestan. It can hold up to 17,000 worshippers. The world's biggest Islamic house of worship is the Grand Mosque in the city of Mecca, Saudi Arabia, which can hold 4 million believers simultaneously on its open territory, 400 times more than its counterpart in Moscow.